Detailed guide for iCloud sign in account. Learn how to login iCloud account on iPhone/iPad/iPod and login icloud.com with step-by-step tutorial. In this guide, we’ll discuss the details of iCloud sign in account on both iOS & Mac, and how to access and use iCloud. com apps. Besides, you can also get useful information about iCloud backup, iPhone repeats iCloud Login issue fix and etc. Firstly, let's see how to login iCloud on iPhone, iPad, and iPod Touch. It is not hard to login iCloud because all you need is an Apple ID (also known as iTunes account). Apple ID consists of an email address and password and it is used to login all Apple devices, products and services that have iCloud. 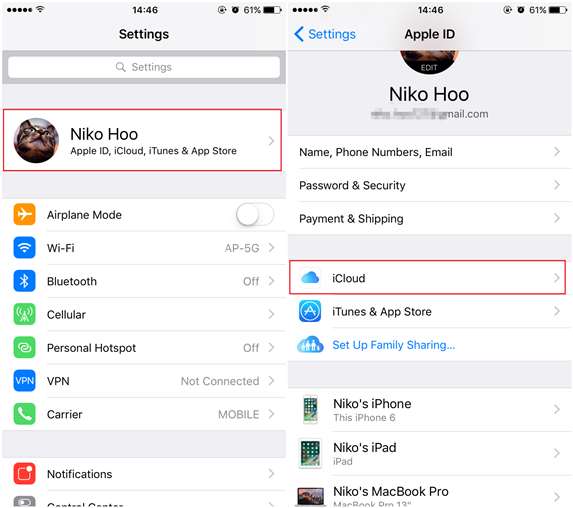 How to Sign in iCloud Account on iPhone, iPad, and iPod? Since iOS 10.3 updates the system to new APFS, it will be a little bit different for you to login iCloud account on iOS 10.3 and the later versions. Follow these steps. Step 3. Tap on iCloud to sign in the account. If you are using iOS 10.2 or the earlier versions, go to Settings > iCloud and enter your Apple ID (email address) and password to sign into iCloud account. How to Login to iCloud. com and Manage iCloud Content? To sign into iCloud on iPhone or iPad only allows you to enable iCloud service and change some settings. If you want to access the content stored on iCloud, delete iCloud photos, check iCloud mail, locate your devices or make use of other iCloud features, you can go to iCloud Login page: icloud. com via web browser. iCloud. com apps include Photos, Mail, Contacts, Calendar, Notes, iCloud Drive, Pages, Numbers, Keynote, Find Friends, Find My iPhone, Reminders and Settings. Step 1. sign into iCloud by entering Apple ID and password. If you set up two-factor authentication, you need to enter the verification code sent to the trusted device. Now, you can access iCloud. com. You are able to use app and switch to another one easily. If you want to delete photos from iCloud or use Find My iPhone feature, you’ll be needing to login iCloud. com. Bonus Tip - How to Fix iPhone Repeats iCloud Login Issue? iCloud is cloud storage service that Apple offers to all of its users. iCloud supports wirelessly sync, automatic backup and share across different Apple devices. With it, all of your Apple devices are connected seamlessly, and you can always keep photos, contacts, mails, notes, documents and etc. up-to-date as well. Compared to traditional iTunes solution that needs USB cable connection, iCloud is easier-to-use and ensures safer and better user experience. Certainly, iCloud is an online service, so it requires an Internet connection to use iCloud features. Each Apple users can get 5GB of free iCloud storage when they create iTunes account. Check how to backup when iCloud is full.